In this new series, we will be sharing mementos from our hometown sports teams in the years gone by. Some will harken back to championship glory, while others will reflect back on some of the more tormenting times for Detroit fans. It didn’t take long to figure out which Detroit figure to start with—it was more of a question of which moment to select from this former Piston who was a Human Sound Bite during his 5+ year stint here. 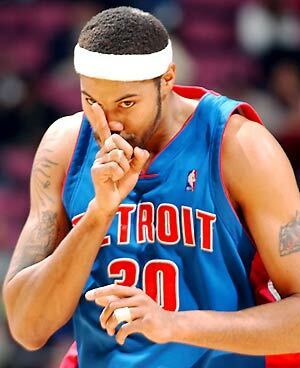 Rasheed Wallace arrived to Detroit in February 2004 via a three-team trade deadline deal between the Atlanta Hawks, Boston Celtics and the Pistons. It didn’t take long for Pistons fans and national pundits to forecast ‘Sheed as the missing piece to a title for the Pistons, as he filled a key void at the power forward position. After taking out the Milwaukee Bucks and the New Jersey Nets, the Pistons found themselves up against the top-seeded Indiana Pacers a team that was as defensively stout (and perhaps as offensively deficient) as they were. In typical ‘Sheed fashion, he shot 4 for 19 from the field, but put in Yeoman’s work on the defensive end with eight rebounds and five blocked shots. The Pistons would go on to oust the Pacers in six games, and of course later topple the Los Angeles Lakers for the 2004 NBA Championship. This entry was posted in Detroit, Pistons, Sports and tagged 2004 NBA champions, 2004 nba finals, detroit, detroit pistons, Detroit Sports, guaransheed, rasheed wallace. Bookmark the permalink. Pingback: Valverde, Tigers’ Closer, Has Knack for Making Things Interesting | My Top News. All News.